Sunday afternoons: DnDs, hosted by Mavonte. Many past events are listed on the Meetup. If they're not there, they might be on Facebook, or the Blog. Oct. 21st 7:30-9:00pm : Multimeter Workshop! Learn how to solder, and build your own Multimeter! Sept. 20th Dues are due! Pay online with the donate button on baltimorenode.org or give Jon or Adam $50 in person. Sept. 19th 1pm-4pm : Pedal Hacking Workshop! Learn to build, modify, and hack "guitar pedals", or any similar sound processing devices. Sept. 13th 4pm : Open studio. Load of Fun (our home) will be having a building wide open studio. Come help the Node represent by coming in and using the space to work on something! Anything! Sept. 12th 3-6pm. The Node has a table at JHU's Convergence 2009. Come check us out around 32nd and St. Paul. There will be a moon bounce. 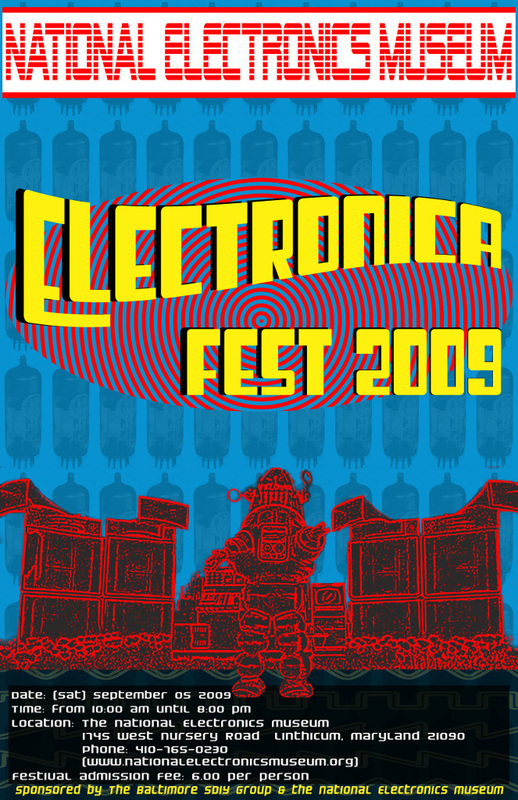 September 5, 2009 Electronica Fest (Poster) - 10AM to 8PM, National Electronics Museum, Linthicum, MD 21090. They're still looking for exhibitors and volunteers. Contact the baltimore-node-discussion mailing list or check the ElectronicaFest2009 page for more details. August 11, 2009 Second regular meeting in the new Baltimore Node! Regular business meetings will take place every Tuesday at 7:30pm at the Baltimore Node's space (120 W North Ave). July 28th, 2009 The show is airing this week due to the time it took to edit the show. Tune in to WYPR's Digital Cafe on Tuesday at 5:30pm. The show's Mario Armstrong with be talking with the Node's own Adam Bachman about the Baltimore Node and the burgeoning, worldwide hacker space movement. WYPR broadcasts on 88.1 FM or you can listen to their live online stream. Listen to the interview! July 12, 2009 Hackerspaces.org is holding a conference call at 5pm EDT. There is an agenda and some instructions for connecting. Mark represented. There is an audio recording available. July 11, 2009 Field trip to the Harford Hackerspace. They are having a meeting at 2pm to discuss 501(c)(3) filing among other things. Nick Farr from HacDC will also be there. Email info@harfordhackerspace.org for the address. July 10, 2009 Visit to 1015 Hillen Street, a potential home for the Node. Meet at the address at 6:00pm. See Craigslist ad. See 1015 Hillen Notes. July 9, 2009 Workshop1 "Ambient Orb" from 7:00 PM - 10:00 PM (ET) at 113 W North Ave (MICA). Get your tickets here! It Worked! Notes and code are available here! July 9, 2009 Visit to 4001 Falls Road, a potential home for the Node. Meet at the address at 2:00pm. See Notes on JBL Properties. July 8, 2009 Visit to 1442 Fleet Street, a potential home for the Node. Meet at the address at 6:00pm. See 1442 Fleet St Notes.